River Plate and Boca Juniors will contest the rescheduled second leg of the Copa Libertadores final at the Santiago Bernabeu in Madrid - over 10,000 kilometres from Buenos Aires. Billed as the biggest club game in South American football history, the hotly anticipated Argentinian fixture was twice delayed on Saturday, postponed until Sunday and then called off following an attack by River Plate fans on the Boca team coach. Governing body CONMEBOL on Tuesday said the second leg would be played outside Argentina on either Saturday, December 8 or Sunday, December 9 and the capital of Spain has now been confirmed as the city where it will take place, on the latter date and kicking off at 2030 local time. Fans of the sides will be given an equal allocation, meaning no 'home' team. A statement released on Thursday evening by CONMEBOL president Alejandro Dominquez read: "The administration has elected to hold the Copa Libertadores final return leg, in front of both sets of supporters, in Madrid at the Santiago Bernabeu on Sunday 9th (December). "Those of us who know the beautiful game know that it is only about winning and losing, not killing or dying." The prime minister of Spain, Pedro Sanchez, tweeted: "Spain is ready to organise the final of the Copa Libertadores between Boca Juniors and River Plate. The security forces have extensive experience of these situations and are already working on the necessary deployments to ensure the event is secure." With the tie poised at 2-2 following the first leg at La Bombonera on November 11, Boca players were left injured by shards of broken glass and affected by tear gas, which was fired by police to disperse the crowd outside River Plate's El Monumental stadium. It had been hoped the final of the South American equivalent of the Champions League, the first between Argentina's most famous clubs, could be completed on Sunday, but Boca asked for another postponement, as some of their players were still suffering from the after-effects of the tear gas. 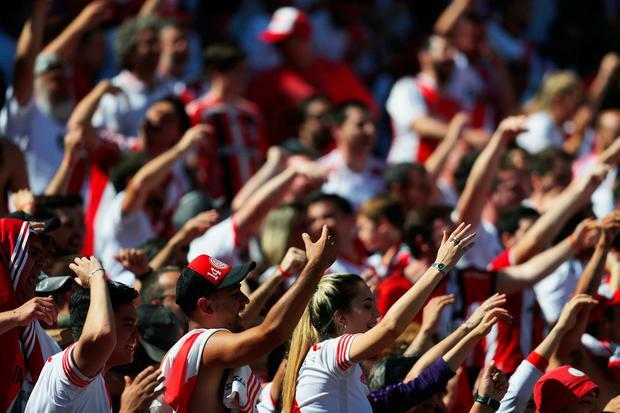 River Plate have been fined £312,734 on account of the violence. The Bernabeu's tenants, European champions Real Madrid, are in LaLiga action at Huesca on the date of the exported Superclasico derby, which will take place some 6,237 miles from its traditional venues.